Click above to download and install Callarama 2. Please Note: If you are not comfortable with this download, please contact us and provide your name and address. I will send you a temporarily activated installation file that can also be shared with other interested parties. This download will upgrade your installation. All personal settings will be preserved, and you can keep saved materials if you wish to. Version and date of your current installation are indicated in the "INFO" tab of your Callarama window. You should run this download if the version or date are lower than indicated above. Click the above download link and select "Run" to start installation or select "Save" and start (dbl.click) "Callarama2Setup.exe". The setup will install or upgrade the software in the root directory of your computer, usually "C:\Callarama2". A desktop icon for Callarama2.exe will be created. This set-up does not install system files. It is based on Microsoft .Net Framework 4 which should already be present on your device. 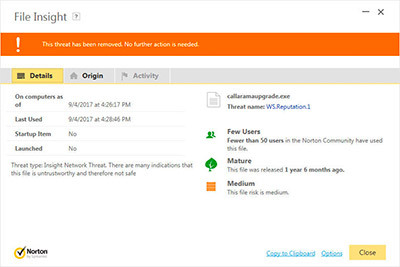 If Callarama 2 does not start or displays system error messages (messages that do not have the Callarama logo), the .Net Framework 4.0 files may be missing on your computer. You can download/update these files from "http://www.microsoft.com/en-us/download/details.aspx?id=17851". To remove the program, simply delete the "C:\Callarama2" folder. Windows warning of a file that is not commonly downloaded. Click "Actions". The following window where you can select "Run anyway". 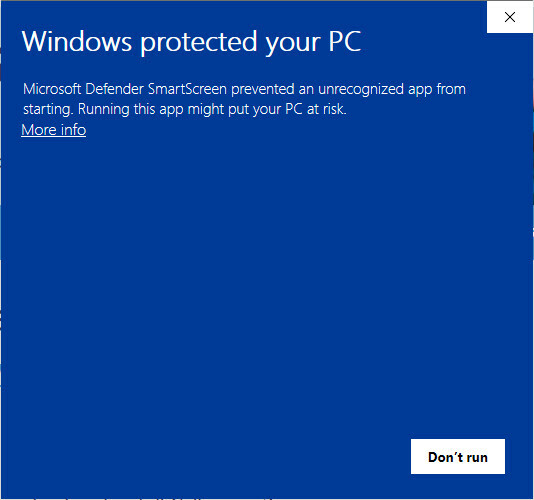 Message from Windows, indicating that an antivirus program has blocked the download. If the antivirus program does not offer a solution, disable it temporarily and repeat the download. 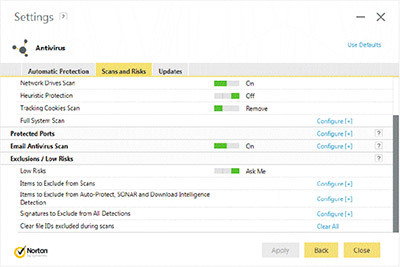 Alert from an antivirus program. In this example (Norton) click "View Details" to follow up. The follow-up page from Norton. There is always an option to allow the download, but these programs make it hard to find. In this example, click "Options" (shown bottom right in blue). The next page from Norton, where you can select "Exclude this program". This should exempt the Callarama download from future scans. You may have to repeat the download after this.